Keeping the morale of those both at home and abroad undoubtedly went a great way to helping the war effort. Entertainment, especially travelling groups that would operate dangerously close to the front lines, brought a slice of normality and home life to those abroad. In this article, we’ll be looking some of the Allied entertainment troops that were brought to troops across the world. The USO is a nonprofit organization established in 1941 that provides programs, services and live entertainment to United States troops and their families. It was formed on the request of Franklin D. Roosevelt and brought together six civilian organizations: the Salvation Army, Young Men’s Christian Association (YMCA), Young Women’s Christian Association (YWCA), National Catholic Community Service, National Travelers Aid Association and the National Jewish Welfare Board. Since its inception, it has worked with the Department of Defense (DOD). The USO gains funding from private contributions from individuals and corporations, operating in over 160 centers across the world. Irving Berlin singing aboard USS Arkansas, 1944. By US Govt. Especially significant during World War II, it became a “home away from home” for G.I.s. Support for the organization brought people together, both at home and abroad. Nearly 1.5 million Americans had volunteered their service in some form. The USO gained fame with its live performances called “Camp Shows”. Hollywood was eager to show its patriotism, both at home and abroad, and many famous celebrities became a part of it. 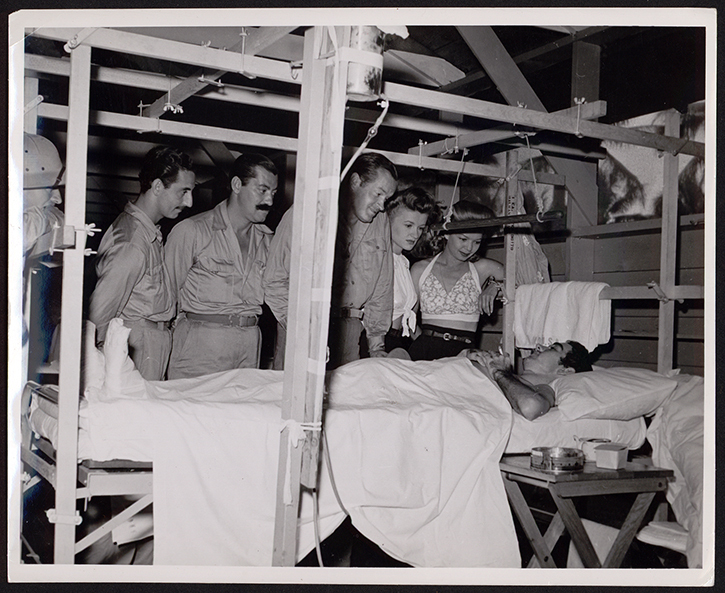 “Camp Shows” began in October 1941, and later that year 186 military theaters existed in the United States. Overseas shows began in November, first touring the Caribbean. Five months later, 36 overseas units had been sent within the Americas, the United Kingdom, and Australia. During 1942, 1000 people performed as part of 70 units. They were paid $100 a week, and the top stars were paid $10 a day. Camp Shows travelled to Normandy in July 1944, just one month after Operation Overlord. Performing units usually contained five performers or fewer. However, The Barretts of Wimpole Street was the first to use an entire theater company and would use theaters in France and Italy. At the height of the USO, in 1944, there were over 3000 clubs, and there were 700 shows a day. Between 1941 to 1947, more than 400,000 performances took place. These included famous entertainers such as s Bing Crosby, Judy Garland, Bette Davis, Humphrey Bogart, Lauren Bacall, Frank Sinatra, and Marlene Dietrich, to name but a few. The Entertainment National Service Association (ENSA) was established in 139 by Basil Dean and Leslie Henson. Its purpose was to provide entertainment for British armed forces during World War II, operating as part of the Navy, Army and Air Force Institutes. The ENSA was later superseded by Combined Services Entertainment (CSE). The first large scale variety concert organized by ENSA took place at RAF Hendon in north London on October 17, 1939. Adelaide Hall (an American, UK-based jazz singer), The Western Brothers and Montovani (conductor) were among the entertainers. During 1945, actors Laurence Olivier and Sir Ralph Richardson were created honorary army Lieutenants in ENSA, who were performing Shakespeare’s plays for the troops in a six-week tour of Europe. While ENSA was very popular, the sheer amount of locations the troops had to cover inevitably meant that some of the performances/shows were sub-par. This earned the organization the popular name of “Every Night Something Awful”. The Army Show was firstly a musical revenue produced during World War II for the Canadian army, then an operational name for entertainment units serving with the army. Brigadier general James Mess of the Department of National Defense sanctioned the creation of a radio series by Rai Purdy produced in Montreal and known to most as the “Canadian Army Radio Show”. The show was broadcast weekly by the Canadian Broadcasting Corporation (CBC). The success of the show led to the creation of a touring stage version for entertaining the troops, as well as promote the image of the army, thus promoting recruitment, increase the sale of war bonds and gain civilian morale. In the winter of 1943, the touring show began work in Toronto. The Army Show opened April 2 at the Victoria Theatre in Toronto to much acclaim. The show toured Canada in the spring and summer. They visited army camps and urban centers, and also gave a special performance at the Anglo-American War Conference held 10–24 Aug 1943 at Quebec City. Later, the Department of National Defense split the troupe into five units to be sent overseas: two would be musical groups and three would be variety groups. These five units arrived in England in December 1943, joining the Canadian Auxiliary Services Entertainment Unit. Rai Purdy became the commanding officer. The units were further divided into smaller groups that would perform in hospitals. They entertained troops throughout England. Then in 1944, after the Allied invasion of Western Europe, the units performed on the frontlines in Holland, France, Belgium and Germany. The Kiwi Concert Party entertained Allied troops in the Middle Easter and Italy, then later, in the Pacific. They were officially known as the Second New Zealand Expeditionary Force [2NZEF] Entertainment Unit and formed in 1941. At the time, an entertainment unit took numerous forms, from variety show format, musicals, or on-stage entertainers. The Kiwi Concert Party differed from most because it integrated the band, as a whole, in sub-groups, and as soloists into the show format. They were tasked with performing as close to the front line as possible and to all allied troops, not just New Zealanders. Yet another factor that made them different from most groups was the fact they were both a concert party and a self-contained military unit. Because of this, about half of their rehearsal time was spent in combat training. The Party’s first revue created was a variety sketch show in the vaudeville style, mixing drama, comedy, novelty items, and a range of music, from classical to jazz. Another element that differed them from other units across the front lines was they created shows that were nothing like military life and included no uniforms on stage. In early May 1941, they were sent to Crete, where they performed for four days while under bombardment. On May 20, the Party took up arms as a combat unit for the first time. After several days, they were on the losing side and were pushed back, forced to leave all of their costumes, instruments and other equipment behind. They also lost five of their members to German capture. After Crete, the Party reformed and re-equipped. Their work took them around the Middle East and North Africa, performing five times a day on the front lines. In 1944–1945, the second Concert Party formed around Italy. A little before that, from 1943–1945, the Pacific Concert Party formed. After the war, the Party would go on to tour around New Zealand, achieving great success.